Washington D.C. Says Goodbye to Its "Mayor for Life"
Along with the rest of the nation, LEAP, LLC, and LEAP Foundation remember and mourn the loss of Former D.C. Mayor Marion Barry. Washington, DC, December 06, 2014 --(PR.com)-- On Sunday, November 23, 2014, former Mayor of Washington D.C., Marion Barry, passed away. Lawrence Executive Alliance of Professionals (LEAP), LLC and LEAP Foundation DC CEO and Chairman, Dr. Clayton Lawrence, took the time to remember, praise, and honor Barry this week in memoriam of the outstanding leader. 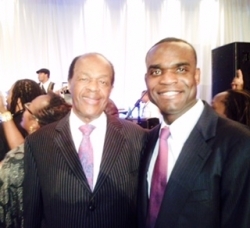 Most who knew Marion Barry, knew him as a prominent civil rights leader, respected mentor, and loyal friend. The only civil rights leader of his time to achieve taking this political office, Barry created a legacy built on fighting injustice and promoting the rights of minorities. Affectionately known in the greater D.C. area as "Mayor for Life," Barry was renowned for his passionate leadership of the city he loved, as he served D.C. in multiple terms on its city council, as well as having served as both its second and fourth mayor from 1979-1991 and 1995-1999. Barry had recently published a book entitled Mayor for Life, which provided an autobiographical account of his life, from being raised with next to nothing in Mississippi, to attaining great heights of success throughout the course of his illustrious political career. Dr. Lawrence and his organizations have been greatly impacted by the support and mentorship from the Barry family over the years. Former First Lady of D.C., Cora Masters Barry, has played a significant role in collaborating with LEAP Foundation DC through the Recreation Wish List Committee (RWLC), which she founded in 1995 during her time as First Lady and which she continues leading today. The partnership between LEAP Foundation D.C. and the RWLC has been instrumental in providing a number of educational and recreational opportunities to disadvantaged youth in the D.C. area. To date the RWLC has supported more than 10,000 area youth in an effort to encourage them to stay in school and pursue post-secondary education. In remarks earlier this week, Dr. Lawrence stated, "It has been an honor and privilege to have known and have had the support of Mayor Barry and his family over the years. The guidance this family has provided me with throughout the course of my time in D.C. has been invaluable, but more importantly, the things this family has stood for in an effort to better Washington D.C. are undeniable. The world has lost a great man, but is better for having had his presence, leadership, and unwavering desire for equality for all. He will be greatly missed. On behalf of myself, LEAP, and LEAP Foundation DC, I extend my sincere condolences and heartfelt expressions of sympathy to the Barry family during this time of loss."